Based on a Peter Pan theme, the playground has a number of different, interconnected areas, designed to promote imaginative play. At the centre is a huge wooden pirate ship, complete with bird’s nest and rigging to climb up and space to explore below decks. 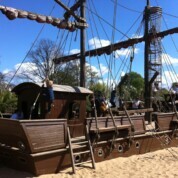 The pirate ship is surrounded by a large beach – so don’t forget your bucket and spade. Elsewhere in the playground, there is a sensory trail to follow, complete with animal sculptures and surrounded by lush foliage. 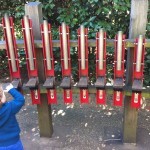 MJ particularly enjoyed the musical instruments garden – where you can play the pipes, a large xylophone and jump on a musical pavement. There are teepees to explore (although they were closed for maintenance when we visited) as well as an array of swings, climbing frames, elevated walkways, wooden huts, balance beams and more. There’s also plenty of seating for adults and space for picnics. The playground is securely enclosed, with only one way in and out, and the number of visitors is restricted. We went on a Saturday and it was very busy, with a large queue forming by the time we left. I imagine a weekday visit would be much quieter – which would be preferable for smaller children to make the most of what’s on offer. MJ was a bit overwhelmed by the number (and enthusiasm) of the older children, particularly in the pirate ship, on the day we visited. 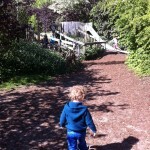 The playground is probably the best of any London park in terms of its variety of play equipment and lovely setting. The main downside is that everyone else seems to know that too, so expect it to be busy – especially at the weekends. 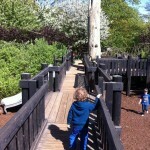 Entry to the Diana Memorial Playground is free. Entry may be restricted during busy periods. The Diana Memorial Playground is open daily from 10am. The closing time varies according to the time of year (between 3.45pm in winter and 7.45pm in summer). Note: The playground is closed from 13 to 17 May 2013 for maintenance and the installation of new play equipment. 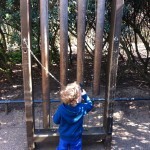 The Diana Memorial Playground is pushchair accessible. There are toilets and baby changing facilities. The Diana Memorial Playground has a café serving hot and cold drinks, snacks, salads, sandwiches and ice creams. By train: Queensway (Central Line), Bayswater (District Line) are the closest tube stations to the playground. High Street Kensington (Circle and District Lines) and Lancaster Gate (Central Line) are also close to other gates into Kensington Gardens.